UPDATE: On Wednesday, March 20, 2019, personnel began to re-energize Unit 2 at OPPD’s Nebraska City Station. A planned maintenance outage on Unit 1 will resume in the near future. When Unit 2 resumes generation, OPPD will ramp down usage at its peaking plants and reserve production units that were used during the flooding. The floodwaters may be receding, but OPPD personnel are still busy ensuring the utility meets customer electricity needs. The historic flooding that struck parts of the OPPD service territory last week impacted the utility’s power plants and other infrastructure. A quick response, and activating the business continuity plan led to a minimal impact on service. As work enters its second week, OPPD is focusing on specific infrastructure needs at the Nebraska City Station generation plant and substations around the service territory. Across Nebraska, nearly two-thirds of the state’s 93 counties had declared emergencies due to flooding and/or blizzard conditions. An OPPD crew in Fremont assisted with trouble calls until they could return home. 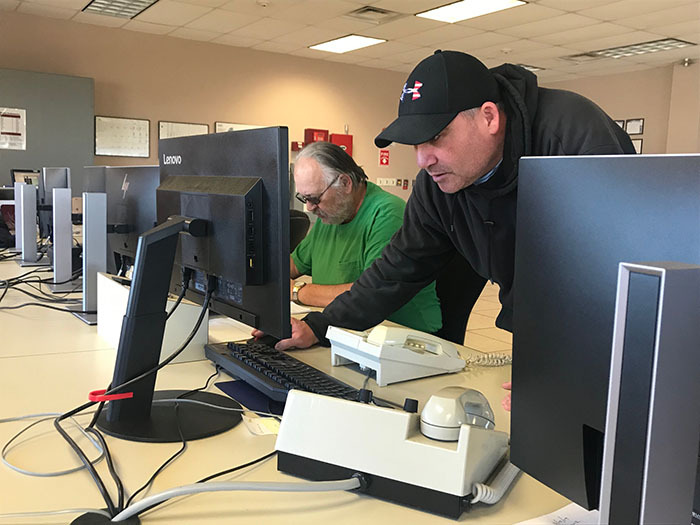 Members of OPPD’s business continuity team and personnel from all departments worked around the clock over the weekend to ensure infrastructure was protected and safe from encroaching floodwaters. And their passion to serve customers never waned. A 5-person OPPD crew found themselves stranded in the Fremont area and unable to cross area rivers to return home. But they kept busy answering trouble calls unreachable due to flooded roads, sleeping in their truck when they could. They stayed in the flooded area for several days until a road opened and they could return home to their families. They were willing to stay and do all they could to help in Fremont, which was almost entirely isolated from outside traffic and supplies over the weekend. The new week meant new challenges for OPPD infrastructure, including shoring up and monitoring a levee near Nebraska City Station (NCS) and ensuring the stability of substations. There were concerns that floodwaters would overtop the levee that helps protect NCS. 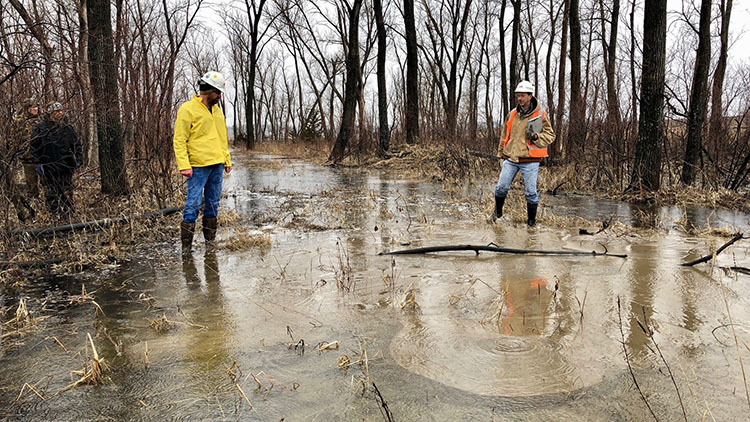 A lower-lying area on the levee about one mile south of the plant is being closely monitored, even as waters stabilize and begin to recede in coming days. The levee stretches along the plant’s boundaries and buffers it from the river. OPPD also used aerial inspections to monitor the levee. Work at NCS continued throughout the night Monday to erect a barrier to protect the access road to the plant. Personnel also filled sandbags through the night Friday to Saturday morning to protect equipment. OPPD made the decision to power down the plant’s second unit the night of March 15 after water levels rose. Unit 1 was already in a planned maintenance outage before the flooding. The utility also put that outage on hold Friday. All staff then transitioned to refocus on protecting the plant. OPPD President and CEO Tim Burke said even though both units at Nebraska City are not online, the utility is meeting customers’ power needs. OPPD also has several generating stations not located along the river to utilize. “We will have enough power to serve our customers,” Burke said. OPPD’s generation fleet has several peaking stations and units on reserve at North Omaha Station. The utility uses the units during periods of high load. The units were quickly called into action to serve customers over the weekend. Personnel worked tirelessly to protect several substations threatened by floodwaters to ensure the power stays on. Crews were managing and monitoring several substations throughout the service territory. 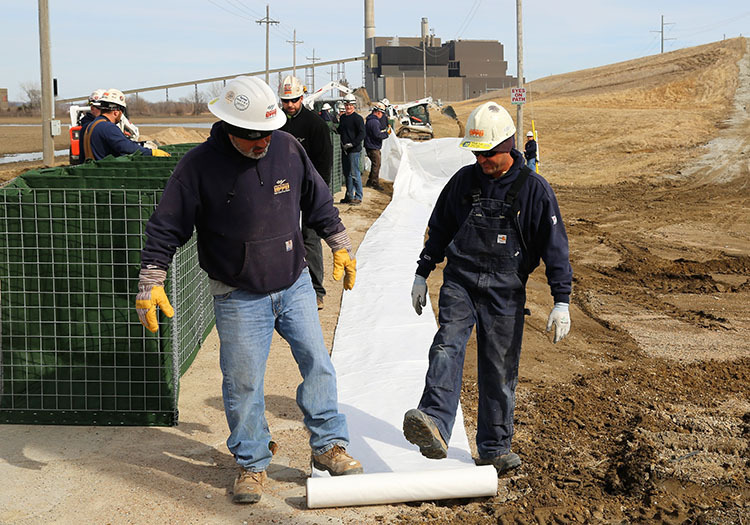 Crews took measures to pump water from facilities and protect them with sandbags and personnel from other areas of the utility’s Energy Delivery department relocated to substations locations to assist. Buckley also called out the work of employees in OPPD’s system operations departments. They ensure electricity is flowing correctly and efficiently as well as coordinating with generation on power flow. “It’s all about teamwork,” he said. As the waters recede, homeowners may be returning to their homes to assess the damage. In areas under evacuation orders, OPPD works with local emergency management agencies to disconnect power to large areas of customers. Individual customers can also request a power disconnection if their home or property is flooded. Re-establishing electrical service to flooded homes and businesses involves inspections and permits. OPPD urges customers to follow a specific process to restore electrical service to their properties. The peakers once again proved their value to the OPPD system. Congrats to the staff. Power when needed!!!! !